Although maternal health has increased worldwide in the past few decades, maternal disorders and pregnancy complications continue to be one of the leading causes of death for women, especially in Latin America. Deaths during delivery and other pregnancy complications have decreased worldwide from 500,000 deaths in 1990 to 289,000 deaths in 2013, yet Latin America’s maternal death rate remains very high according to the World Health Organization (The New York Times). In Andean Latin America, Central Latin America and Tropical Latin America, between 327 and 473 women per 100,000 continue to die, depending on the particular region. Deaths are mostly due to post-partum hemorrhaging, unsafe abortions, and eclampsia (Institute for Health Metrics and Evaluation). In order to reduce these numbers and ensure safe births, access to proper healthcare and medically trained midwives is crucial. The majority of women dying during childbirth or from childbirth complications typically live far from medical facilities in impoverished rural areas. Travel to proper hospitals or clinics is long and expensive, thus many women do not seek medical assistance. If they do, many women choose traditional help from midwives instead. While having doctors or nurses in rural areas would be ideal, a more cost-effective strategy is to improve midwife training, specifically in reference to modern biomedical practices, and provide them with necessary supplies such as birth kits and IV kits. Many regions, such as the state of Chiapas in Mexico, have begun training traditional midwives with medical knowledge that will allow them to save more lives should complications arise during childbirth. 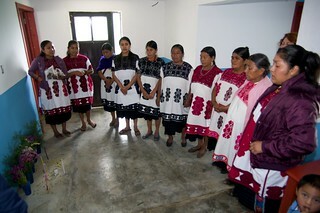 Both the Mexican government and international aid groups are sponsoring both training and birthing facilities. (The New York Times). In addition to the cost efficiency of training midwives already established in rural communities, it may also be more culturally and socially appropriate. Outside doctors may face cultural barriers entering tight-knit, rural communities where traditional beliefs and medical practices are common; individuals may be wary of unknown practitioners and/or unknown methods. Conversely, trained traditional midwives do not face such barriers as they are already active community members. Despite midwifery’s potential to decrease maternal deaths and post-partum complications, midwives continue to face challenges acquiring training and resources. In many Latin American countries, such as Venezuela, midwives are not recognized as part of the healthcare infrastructure for perinatal care. (Midwifery Today). Therefore, despite their desire to improve birthing conditions and maternal health, the scope of their aid is limited. Even in Chiapas, where specific midwife training programs have been implemented, there is a lack of instruction from professionals and materials. Groups of midwives around the world have come together to petition for official recognition from governments, hoping this will increase the amount of government funding and support for midwifery. Although small steps towards training midwives and decreasing maternal death rates have been achieved in Latin America, improvement of existing programs and the implementation of new ones remains necessary. Training new midwives and improving traditional birth assistance methods is a promising way to increase maternal health in impoverished and geographically isolated areas. As Latin American governments and international aid organizations assess existing health programs or establish new ones, prioritizing midwifery is a step worth taking. “GBD Compare Heat Map.” Viz Hub. Institute for Health Metrics and Evaluation, 2015. Web. 20 Oct. 2015. “Training Midwives to Save Expectant Mothers in Chiapas.” The New York Times. The New York Times. 31 Aug. 2015. Web. 20 Oct. 2015.